It is not everyday, in fact it’s more like never, that I come across a Craigslist app that visually stuns me. Usually, it’s just open up the app, thumb through boring looking posts and then exit out. With the Mokriya Craigslist app, the experience is much better and more beautiful than one could have first imagined. When you first open the app, you can specify a certain location with a pretty dial system or get straight to browsing by category. 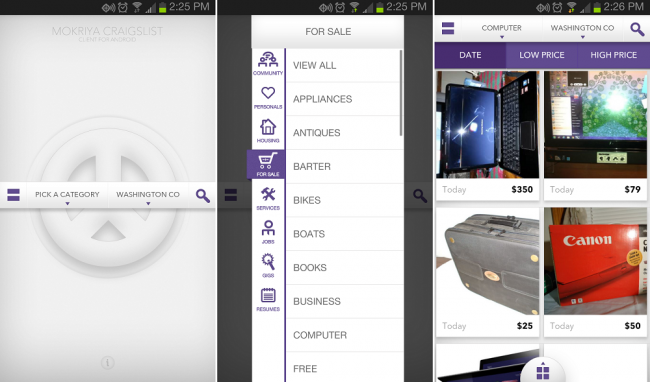 Each listing is wonderfully organized and it makes browsing a hectic site like Craigslist a fun and attractive time. The app is free on Google Play with no ads, but with an IAP of $1, it unlocks the ability to post listings to the app and also receive notifications on items that go up for sale, making sure you don’t miss anything you have been looking for. Below, I go hands on with the app to give a brief overview of how it works.